Give a handmade holiday stocking stuffer with these cute mint, vanilla and pine scented soaps. Spruce up your holiday craft show table with these wintertime soaps! 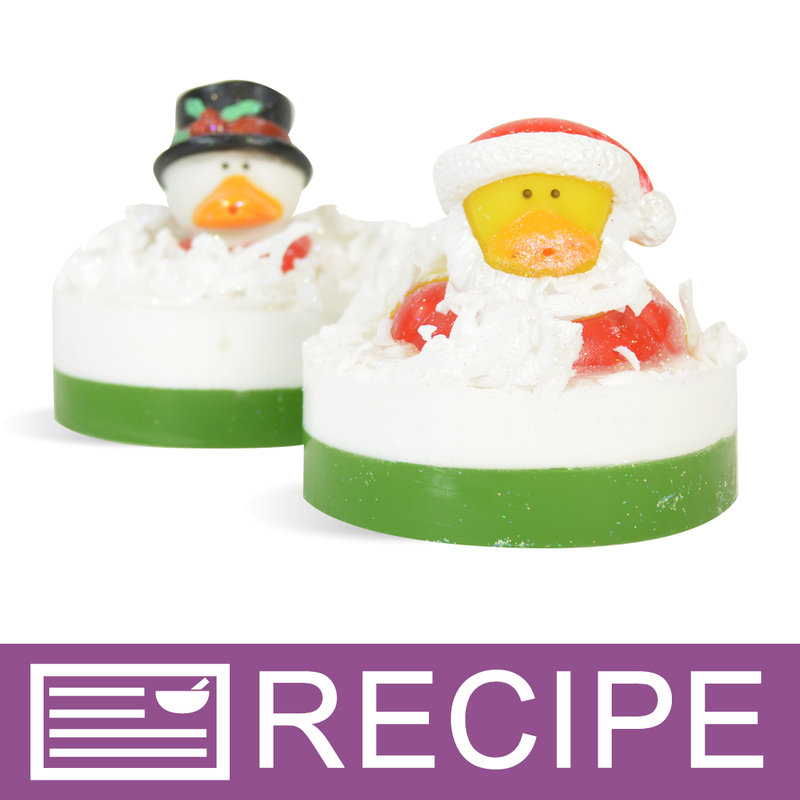 A seasonal duck sits on top of grated soap in these festive products. This project comes with a collection of different ducks including snowmen ducks, Santa ducks and reindeer ducks. Sell these at your December craft show or make then as adorable stocking stuffers! COMMENTS: I don't usually do melt and pour, but I needed something for a fair which would have a lot of kids and I had a 25% off any kit coupon, so this is what I went with. The end result is adorable! These were easy to make, although it does take a while since you have to wait for the individual layers to cool before pouring the next or unmolding and you can only make 6 at a time. So to make all 24, the waiting is repeated 4 times. There is more product (soap base, color block, fragrance) than is needed to make 24, so that makes the cost per item a bit better than it appears at first. I ran out of glitter about halfway through. But maybe I just went glitter crazy? Popping them out of the mold takes so muscle, but not a single one was damaged in the process. Getting them into the bags was really the only part that gave me any trouble, but it's doable if you turn the bag mostly inside out (like filling a frosting piping bag) and then rolling the bag up over the soap. COMMENTS: These little holiday ducks made the perfect soap for a child. My kids absolutely loved them and I am glad to be adding them to my product line. The Jack Frost scent is a nice touch. Easy to make, fun and a nice little gift. "With this kit do you receive the Holiday Duck Toys (pictured) or the SWEATER Holiday Duck Toys (description of the kit)? Thanks. " Staff Answer The kit contains the Holiday Duck Toys not the Sweater Ducks. We apologize for this error and have updated the site.